The Attea Band musicians performed so well last Thursday. Let's keep up the great work! If any parents have pictures to share from our concert, please email them to me. (areatherford@glenview34.org). This week during morning rehearsals we will get our packets full of fun music to help us prepare for the annual holiday assembly at Attea. (Date TBD). Please bring your updated iPad to your band lesson this week. We will learn how to record scales onto the Garage Band app. Today I am waiting in Northwestern University's Auditory Neuroscience Lab while my son is participating in a long-term study on "Neural Representation of Acoustic Signals". My children have participated in numerous studies at the different labs at NU, but this might be my favorite because they tie so much of their work to the benefits of music! Please check PowerGrade to make sure all your assignments and lessons have been recorded for your report card. Come see me if you have any questions. Remember that you may retake any playing tests by Friday if you would like to earn a better grade. (Retakes can happen during your lesson or any x-block this week - just see me for a pass). If your grade for the Fall Concert is missing, it means you did not hand in your Concert Packet. Please do that no later than Monday at 3PM! 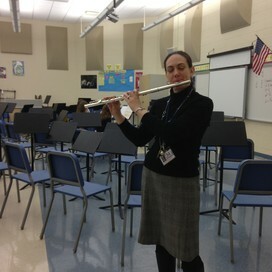 Parents are invited to visit the band room. 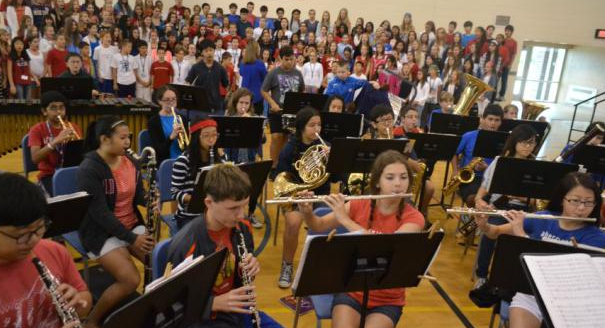 Parents are encouraged to attend any rehearsal from 7:20-8:15 to see exactly how middle school band musicians learn and rehearse music. Even if your child is less than eager to practice at home for you, visitors will see how much our musicians love playing their instruments with a group. An audience makes it even more fun! ¤ I can play the correct dynamics and articulations in our concert pieces. ¤ I can play the fight song by memory. ¤ I can identify and define accidentals. ¤ I can locate and follow the key signature. ¤ I can play half steps. ¤ I can count and play dotted quarter-eighth note rhythms. ¤ I can count and play in cut time. ¤ I can count and play syncopated rhythms. ¤ I can count and play syncopated rhythms in cut time. ¤ I can count and play 16th notes. ¤ I can follow the key signature in Concert F Major. ¤ I can play the Concert g harmonic minor scale. ¤ I can play music in the key of Concert g harmonic minor.